Lehinch Lodge in Lahinch County Clare is perfectly situated to enjoy the abundance of attractions that North Clare has to offer. The following is just an example of these many attractions. 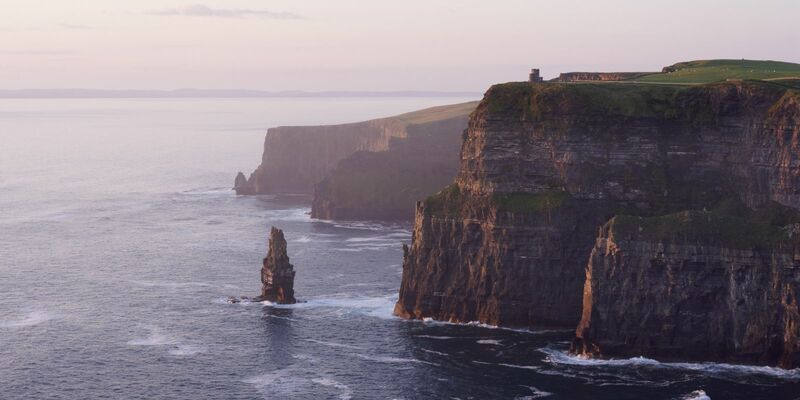 n the west coast of Ireland are one of the most outstanding coastal features of Ireland. The cliffs rise from Doolin and ascend to over 213 metres just 3 miles south of the village of Doolin. Being almost vertical, their sheer drop into the Atlantic ocean is a haven for sea birds. The Aillwee Cave is so much more than just another cave. Aillwee cave is unique to the geology of the Burren and it enables you to explore a little of what lies under the exciting landscape. This stunning creation of nature was formed by the melt waters of a prehistoric ice age. The Burren Bird of Prey Centre at Aillwee Cave is home to birds from all around the globe including falcons, hawks, owls, eagles and vultures. Each enclosure offers an opportunity to see, hear, and interact with these majestic creatures and learn about the ancient sport of falconry. Fun for all the family. Features include an Aquarium, 25m heated swimming pool, jacuzzi, sauna, steamroom and Kiddies pool. In the Aquarium you can come eye to eye with some rare and spine chilling fish species as they surround you. Doolin Cave is one of Europe's most compelling cave attractions. It is a truly authentic experience. From the moment you descend into the first tunnel you will enter a world carved by water. Donning your hardhat, you will follow the rough-hewn route of the early explorers who discovered the cave. This is Ireland’s first Perfumery. The Burren Perfumery's visitors centre has a unique photographic exhibition and outstanding audio -visual presentation. All products are on display and available to sample and purchase in the showroom. For anyone interested in the changing face of Irish life, the Michael Cusack Centre is a treasure chest of living history. Open April to September (Winter tours by appointment), it is a top tourist attraction and popular destination for school groups and sport enthusiasts. Hiking company based in Galway offering self-guided hikes in the Burren as well as other fabulous locations.